Whitening Offer – Prepare to Dazzle! Home / Teeth Whitening / Whitening Offer – Prepare to Dazzle! Most of us would probably like our teeth to be a little bit whiter if not quite a bit whiter but did you know it is easier than ever now to achieve this? Over time, some of the foods and drinks we consume can stain our teeth and they do generally darken with age. This does not need to be permanent but it does need an effective whitening agent to lift the colour. The first stop on any whitening treatment is to have a good general clean. Removing all the surface stains and hard deposits allows the whitening agents to start working immediately and will get you the best results. Our dental hygienists will also help show you how to maintain the whiteness once achieved. There is only one effective method to actually whiten the structure of your tooth. You may have seen all sorts of claims from non dental companies but the evidence is that only Hydrogen Peroxide will whiten teeth. This can be in the form of a hydrogen peroxide gel or as a carbamide peroxide gel that releases hydrogen peroxide. Only dental professionals are qualified and allowed to use these gels on your teeth and even then we have to control the concentrations we are able to use. Your dentist will discuss with you the best concentration with you depending on past experience, age, depth of darkness etc. Which System – In Surgery or Home Whitening? We are delighted to be able to offer you a combination of both at Barrington Dental Care in Altrincham. 3. Continuation of treatment with Home Whitening trays – custom made for you. Why Not Just The In Surgery Whitening on Its Own? An In Surgery treatment gives great results but we find if you add in the home trays and continue the process at home the results are better and will last longer. The beauty with this system is that you can top up whenever you need to. Most people will probably want to brighten again after a few months and one or two applications at home are all that is required. Whitening will fade but never back to the darkness you had when you started so a refresh every now and again is a great idea. At this time of year some of us are thinking about summer holidays, perhaps even attending a wedding or two or maybe getting married? 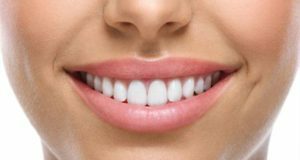 This is a great time to consider whitening your teeth and brightening your smile and it is such an easy and simple treatment when carried out correctly by your dental professional. There can be some side effects such as sensitivity, we can help reduce this by using lower concentrated gels and desensitising agents so don’t let this put you off if you have had this problem before. 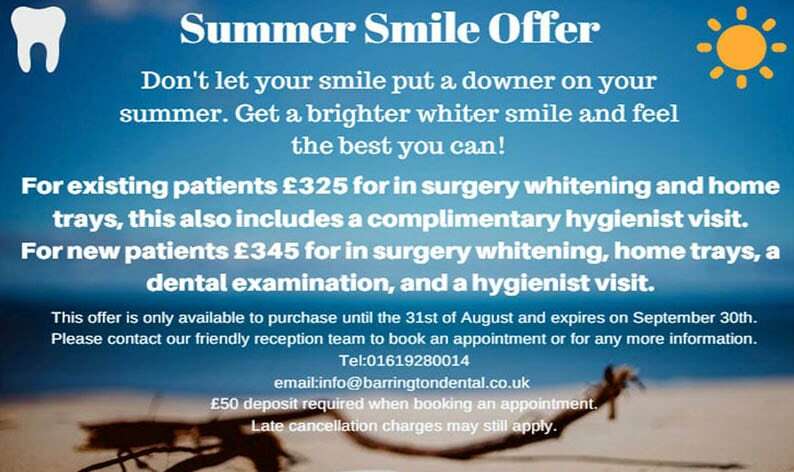 We currently have an offer for Tooth Whitening that runs until the end of August 2018. If you would like to find out more or take advantage of the offer please get in touch with our reception team or message either by email or through our Facebook & Instagram pages and we can start to help you dazzle this summer. To take advantage of our fantastic teeth whitening offer, contact your dentist in Altrincham on 0161 928 0014.